I used to do a lot of hand quilting, but haven’t done so in many years. Until this week. I started working on my antique top. This is how far I have gotten. My quilting stinks, but I am forging ahead anyway. I was asked about the batting i am using. I’ve had this around for years and do not know where I bought it. It is 100% cotton and it is made by Mountain Mist. I’m using John James Betweens in Size 10. I was also asked about what I used for marking. I used the silver pencil to mark the largest arc for each fan. I did this before basting so I could map out my plan. Just before quilting each fan, I line up the stencil and use the chalk to mark the smaller arcs. You can tell from my pictures above that I am not very exact. I was also asked about the thread I used for basting. I just used whatever was already on the long arm. It gets removed anyway. I’m keeping up with doing at least one hoop worth of quilting each day. My fingers are a bit sore! 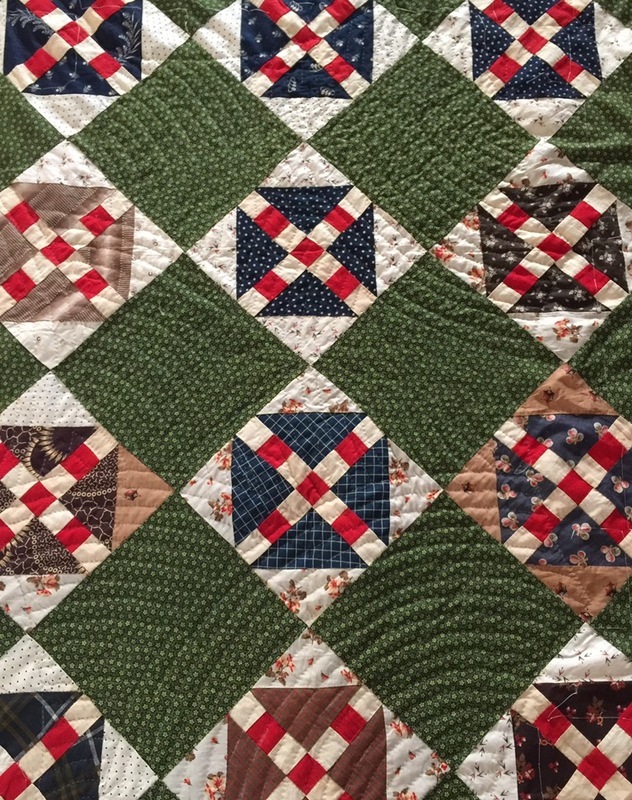 This entry was posted in Hand quilting. Bookmark the permalink. I echo previous comments. Lovely work. The baptist fans are a great choice for this piece. I am working on smaller quilt myself and am progressing at a much slower pace than you! Looks like you are doing a great job! 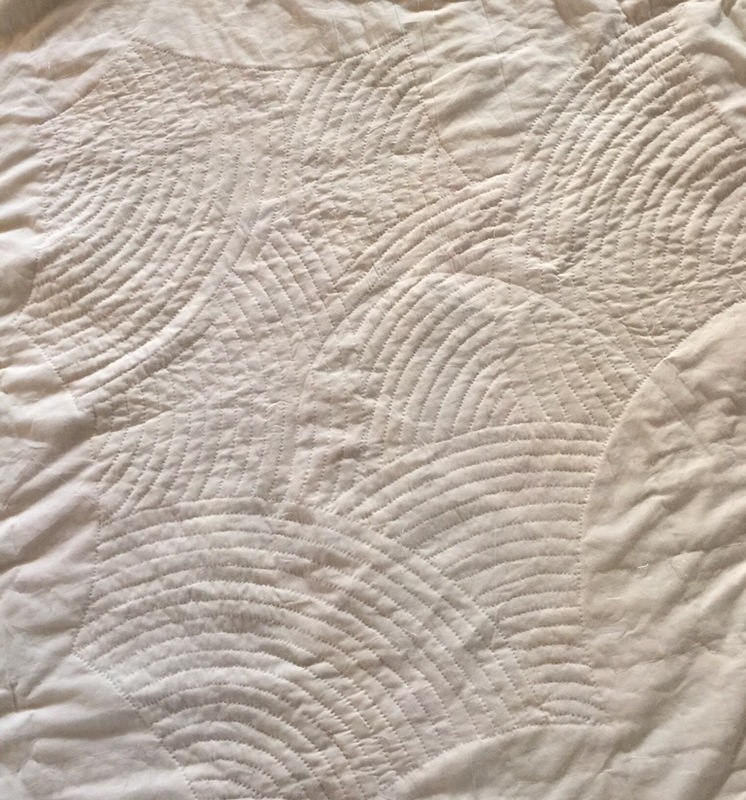 I’ve done some hand quilting…Not as easy as it looks!!! Keep up the great work!! Love how this is looking, Katy! I am a hand quilter, and, let me just say….you are really moving along!! 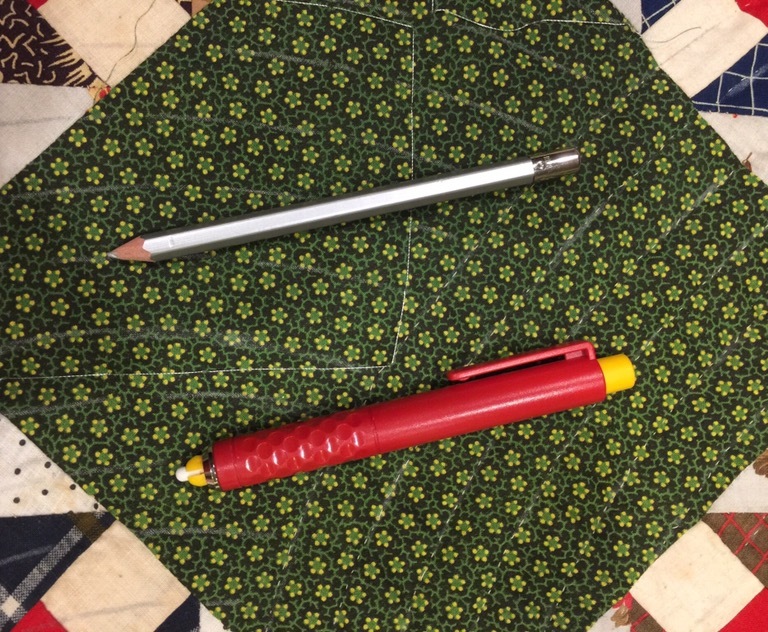 The fan quilting is the perfect choice…and one of my favorites…. Thanks so much for sharing this quilt’s journey! You have really been quilting in earnest to get so much done in such a short time. It looks incredible! I use John James Size 10 Betweens too. Your hand stitches look fine. We are all our worse critic. I have yet to do the baptist fan, yet it is on my list. Keep progressing. Yummy! Love the fan quilting! It doesn’t stink at all! Looks great to me! I have that red marking tool as well. I have hand quilted the Baptist Fan for some of my quilts. Have done very little hand quilting in the last few years. Always nice to see someone taking time to do that. I think you’re quilting looks just fine. Thanks for sharing your marking tools; I’m always learning something new from you. You are making really good progress on the quilt! I don’t think your quilting stinks. I think it looks quite pretty. I like the way the fans complement the squares of the quilt. That looks great. Keep it up and your quilting calluses will be back in no time. I like the way you are free placing the fans – very nice and looks antique!